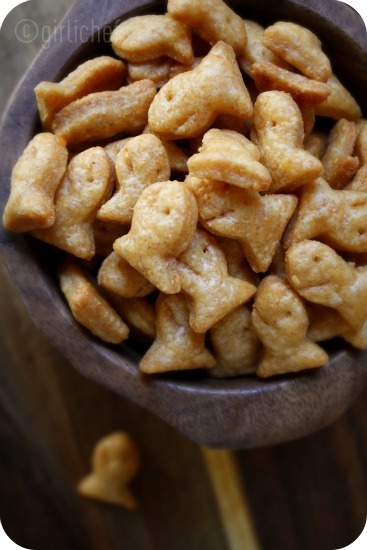 Met with strong reviews, these Whole Wheat Goldfish Crackers have earned a place on our pantry shelves. 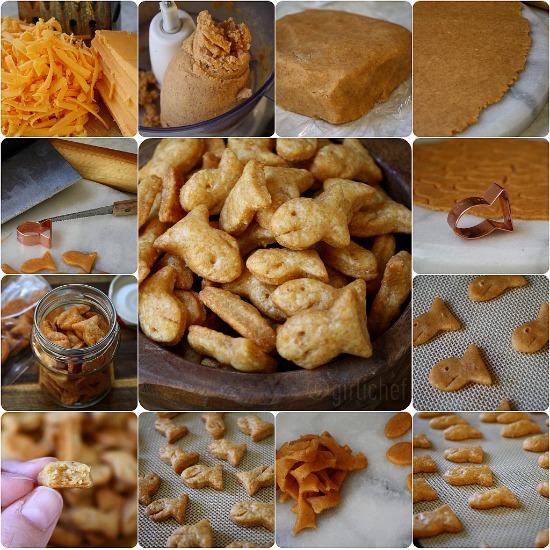 This was one of those recipes that I knew I was making before I even read past the title. 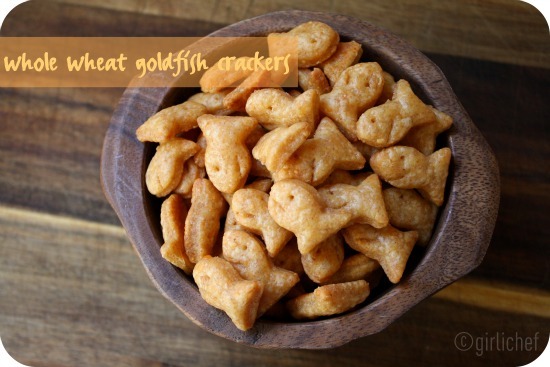 Kids love goldfish crackers. At least I think I can generalize and say "kids"...because I've never met one that didn't. I imagine there's a few out there that don't (mingling with the kids who don't like pizza), but for the sake of being right, I'm going with the generalization. Roll the dough out 1/8" thick. I used a slab or marble (unfloured) and my bench scraper to lift the shapes from it after they were cut. 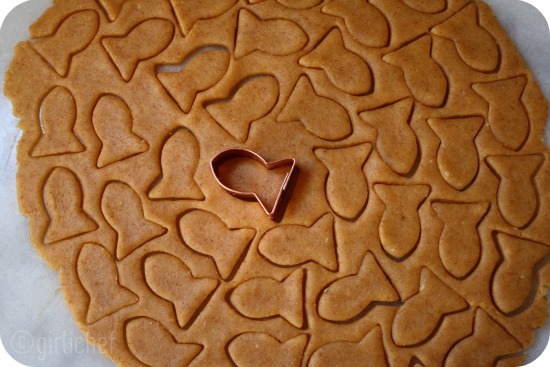 You can also lightly flour your work surface and rolling pin first, if you wish. 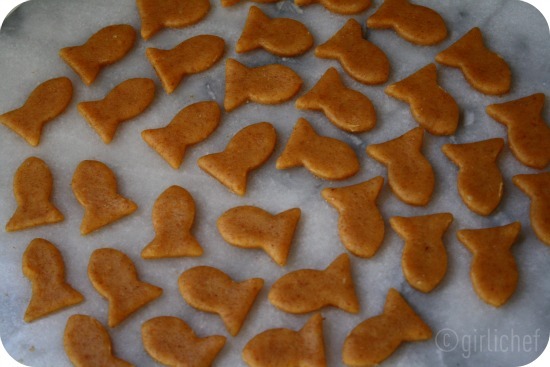 Form shapes with a mini-fish cutter (dip cutter in flour if it seems to stick). 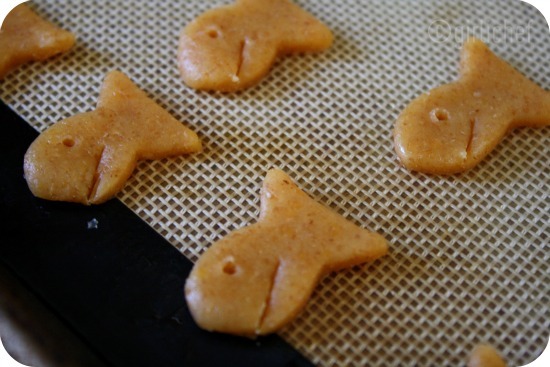 Gently transfer dough to an ungreased cookie sheet (&/or lined with parchment or a silpat) leaving about a ½" between each. Poke an eye into each fishy (I used a toothpick...poked it in then moved it around a bit) and add a mouth (I used a grapefruit knife as Deb from Smitten Kitchen recommended...although I have to admit some of mine look more like sharks than fish). Bake the crackers on middle rack for ~12-15 minutes, or until they are just slightly browned at the edges. Remove from the oven and set the cookie sheet on a rack to cool.